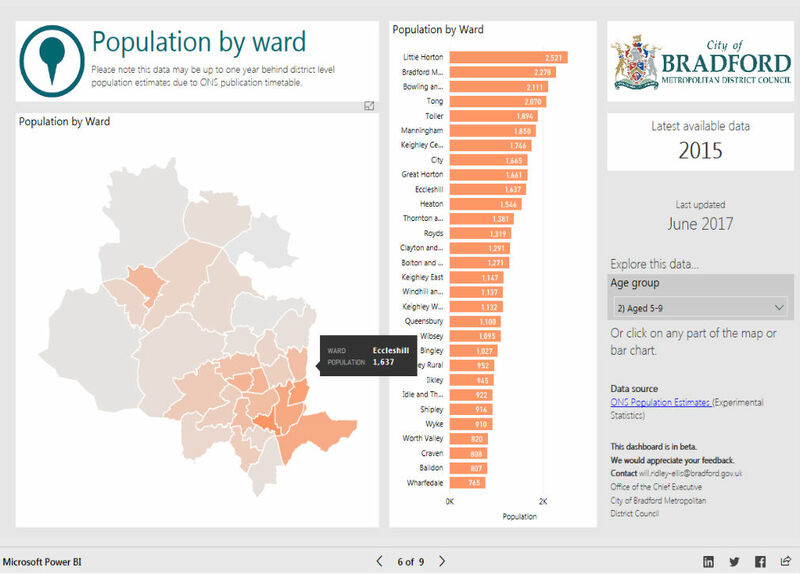 The Bradford District Dashboard brings together the key datasets that measure the district and presents them in an engaging and interactive way. The District Dashboard has been designed to be accessible to everyone from elected members, senior management, partner organisations to front line staff and even members of the public. It links directly to the Bradford District Partnership’s priorities and measures the success of our collective ambitions. By cutting through the vast amount of open data available and presenting it in an engaging and interactive way we are helping to level the playing field; no matter who you are, or what your role is, you can access the high level information you need about how the district is doing. We have broken through the norm of impenetrable static reporting, reducing opportunities for time lags, reporting discrepancies and ‘blaming the data’. •Brought together a group of people at the start of our journey, to establish and understand the problem by developing a Problem Tree. Open data has been a great place to start as it allowed us to utilize free to use versions of Power BI to explore the software’s potential. Because the dashboard brings in national data we have been able to share our work with other interested councils, so they can adapt it. Our approach to involving people and always having a user-focus has had a profound effect. By engaging people from the start we have built up lots of backing an enthusiasm for what could be possible using Power BI. Crucially, that backing is both at the top of the organisation right down to the people responsible for analysing and presenting performance and intelligence information. One of our breakthroughs was the use of District Dashboard at our Senior Leadership Team meeting. Instead of relying on traditional, time consuming written performance reports they used District Dashboard live, responding to the discussion by navigating around the information directly on screen. Staff are notified of monthly updates via the Council’s Intranet. A range of staff from all levels have provided good feedback and are finding it useful. We have established a council priority programme invest in and roll out Power BI within the organisation, initially to focus on financial reporting, human resources, adult social care and children’s social care. We will also be looking for opportunities to engage the public directly, for example allowing people to self serve frequent FOI requests in a simple to use, engaging manner.